Progressives shouldn’t confuse a political victory with a policy victory on the sequester. The two sides are, naturally, quite far apart. The White House has offered a sequester replacement plan that it touts as “balanced” and thus ostensibly palatable to Republicans, though the administration is actually selling itself short: the plan should be quite appealing to the GOP exactly because it is unbalanced. The plan offers $930 billion in budget cuts with only $680 billion in revenue ($100 billion of which comes from Chained CPI, anathema to most progressives). Republicans, meanwhile, want a sequester solution with no new revenue whatsoever—“The revenue issue is now closed,” House Speaker John Boehner said on Thursday—and many Republicans would like the sequester cuts rejiggered to spare defense spending and hit domestic and entitlement programs even harder. So both sides are now playing the blame game, hoping that the public will get seriously angry about the disruptions caused by the sequester and blame the other side, thus bringing them to the table ready to give concessions. There is substantial reason to be optimistic that Obama has the upper hand and will “win” this battle. The public appears to be on his side, and serious fractures within the GOP may soon emerge—defense hawks who cannot abide the Pentagon cuts much longer, and rationalists within the party who think the brand is being irreparably damaged. But for progressives, is it really a win for Obama’s preferred approach to prevail? The emerging consensus is ‘no.’ Some of the cuts Obama offers are plain bad, like his offer to “reform” federal retirement programs and save $35 billion, which means in essence to take $35 billion from the pensions of public workers. Many cuts are inoffensive, and some are good cuts: like reducing certain agricultural subsidies and reducing Medicare payments to big drug companies. Cutting entitlements for any reason is a no-go for many Democrats in Congress, especially when coupled with nearly a trillion dollars in budget cuts. That’s what would happen if Obama’s plan wins, and it’s what worries liberals. “There’s a broader concern about the fact that entitlements may get ensnared when we go to an alternative fix, [that] they won’t escape,” Representative Jerry Nadler told BuzzFeed. The AFL-CIO issued a statement this week that didn’t back Obama’s “balanced” approach, but called for the sequester to be straight-up repealed. “There’s no need to replace the sequester in full or in part. We don’t need it. Republicans are saying we need to address the source of the problem as leverage to get entitlement cuts,” it read. The Congressional Progressive Caucus has also called for sequestration to be completely repealed. That’s the best-case solution for progressives. (Realistically speaking, of course. The actual best-case solution is the comprehensive plan released by the Congressional Progressive Caucus.) But Boehner probably won’t be able to sell a full repeal of spending cuts in exchange for exactly nothing to his rambunctious hard-core caucus in the House. There might not be any deal to be had here. In that case, sequestration stays in place. That’s definitely worse than repealing it, but is it really worse than Obama’s grand bargain? Under sequestration half of the cuts come from defense spending; Medicare is protected except for a 2 percent cut to doctor reimbursements, and Social Security, Medicaid, the Children’s Health Insurance Program and food stamp programs are protected entirely. The other domestic cuts are no doubt painful and bad policy, but progressives have a tough choice in weighing that against what Obama’s proposing. And this of course assumes Obama gets everything he wants, which will not happen. 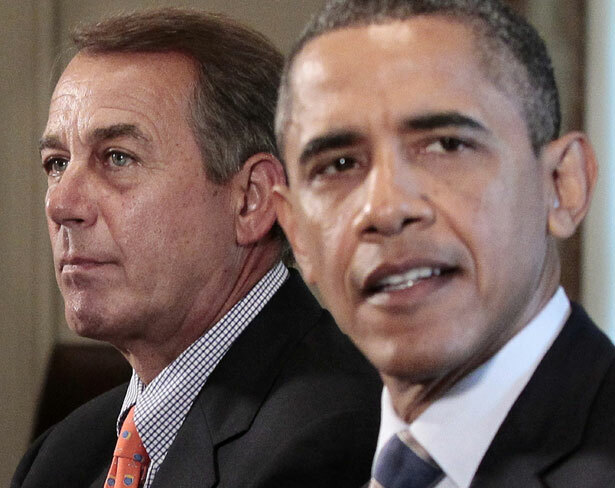 Whatever bargain Congress and Obama strike out, if they manage to get something done, will almost certainly be worse. There are real dangers to enacting some kind of bargain with Republicans to end the sequester—clearly on policy, but also on the politics, even though the administration seems to think otherwise. If White House aides truly believe that achieving a “grand bargain” that includes chained CPI will yield some sort of political victory, they ought to pay closer attention to the blame game now happening around the sequester. One of Bob Woodward’s central claims, and the one that spurred the now-infamous pushback from the White House, is that Obama’s team came up with the sequester. This has been relentlessly pushed by Republicans (who invented a corny #Obamaquester hashtag) and by far too many mainstream media journalists. This is plainly ridiculous—Obama wanted a clean debt-ceiling hike in 2011, and Republicans denied it and forced a showdown. Republicans were not enticed by what the White House offered to end the standoff and demanded some kind of guarantee of budget reductions, and at that point an administration official proposed sequestration as a tool. To strip that final piece of the timeline of all preceding context, and say that somehow Obama wanted the sequester, is exactly backwards—but it’s what is happening. In short, the sequester is a disaster, but a potentially worse disaster may lie ahead. There are no good choices here, only less-bad ones, and progressives should be wary about confusing political victory with a policy victory. In better news from Capitol Hill, Democrats think they may be able to push through a financial transactions tax this time, George Zornick writes.